Prices for beef exported to Japan has been easing of late, which is a bit of a concern, given Japan is our major high value export market. With Japanese beef export prices sitting on a key support level, we take a look at what might happen to markets if prices break lower. In 2016 just under 26% of Australia’s beef exports went to Japan, totalling 264,325 tonnes. Figure 1 shows that Australia’s beef export to Japan have been on the decline for the last 10 years. Declining export volumes to Japan have been largely due to the US increasing market share after being locked out of Japan from 2004 to 2006. Not surprisingly there has been more grainfed beef displaced in Japan, than grassfed beef. The US export exclusively grainfed beef to Japan, and as such Australia is still the main source for grassfed beef. 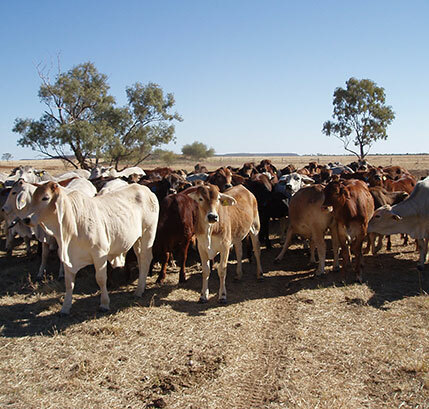 Australian beef has also found markets other than Japan, where the value is similar. 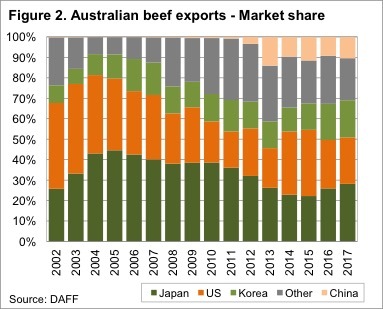 The ‘other’ markets, mainly South East Asian Countries, and China, have increased their share of Australian beef exports to 31% in 2016, up from 12% in 2007 (figure 2). 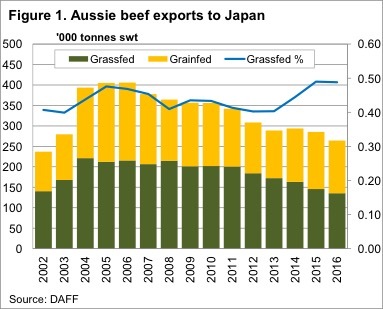 Regardless of the shift in export destinations, Japan still remains a very important market for Australian beef, and changing prices there will impact cattle prices in Australia, eventually. Figure 3 shows the price of Grassfed Fullsets exported to Japan, along with the 90CL Frozen Cow exported to the US, and the monthly average National Heavy Steer Indicator. Since November the Grassfed Fullset has fallen nearly 9%. A majority of the price fall occurred in December, as US beef imports increased 9% on November, and a massive 31% on the previous December. Australian beef supply was also larger in December, up 3% on November, and 17% on December 2015. The Grassfed Fullset price currently sits at 834¢/kg swt, which as shown in figure 3, is still 27% stronger than 2014, and 48% above the 2010-2013 average. Despite the fall in US cattle prices, and further shrinking of our market in Japan, beef export prices to that destination are finding solid support at 800¢/kg cwt. Australian Beef exports to Japan have been shrinking, with grassfed beef gaining a larger proportion. Beef export prices to Japan have eased in recent month, now sitting on key support levels. Tight supply of grassfed beef should continue to support prices in the short term, but there is medium term downside. Heavy steer prices fell in line with export values in late 2016, and currently sit in the 540-550¢/kg cwt range. If export prices can hold at current levels, heavy steers should find support at 500¢/kg cwt if and when supply increases in the autumn. Over the medium terms the risk is that increases in cattle and beef supply, both on a global and national scale, pushes Grassfed beef export prices to Japan back to around the 700¢ level. This would be more in line with where the 90CL Indicator is currently sitting. A move of this sort would see Heavy Steers making more like 400-450¢/kg cwt, than the 500-600¢ we have seen in recent times.